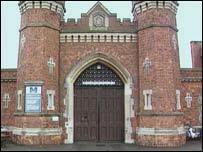 Two East Midlands prisons have been identified as the most crowded in the country. A report released on Wednesday claims Lincoln Prison is overcrowded, unstable and suffering inconsistent leadership. The Prison Reform Trust report also identifies Leicester Jail as being overcrowded. The claims have been dismissed by the Home Office. The Trust has highlighted Lincoln Prison as having a high turnover of governors - four in the last five years. It also labels Lincoln as the nation's most overcrowded, holding 13 over its maximum capacity of 380. The Trust described the situation as a "recipe for disaster". 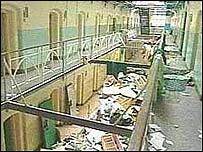 Last year 150 prisoners caused extensive damage inside the Victorian building during a major riot. One prisoner, Lee Blake, 37, of Scunthorpe, died from a drugs overdose after the riot. But prison officials have strongly rejected the Trust's claims. They say the turnover of governors is not caused by bad management but is the result of promotion and career development. The Home Office also says that since the riots of last year, there has been no overcrowding. It says Lincoln currently holds about 400 prisoners, which is below capacity. The Trust says this is based on certified capacity, rather than operational capacity.